Man Behind Lens: JPEGmini - photos on diet? JPEGmini - photos on diet? As long as I can remember, we have been trying to make digital photos smaller for faster on line uploading or when emailing them to friends. For a long long time, JPEG is the default format that everyone use. In computing, JPEG ( /ˈdʒeɪpɛɡ/ jay-peg) is a commonly used method of lossy compression for digital photography (image). The degree of compression can be adjusted, allowing a selectable tradeoff between storage size and image quality. 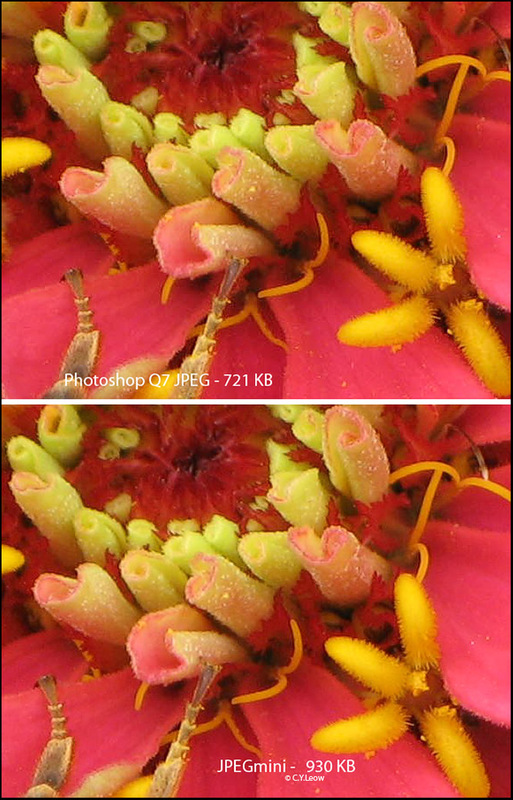 JPEG typically achieves 10:1 compression with little perceptible loss in image quality. I remember fondly, in the early days of internet; the fastest way to break a friendship was to email them a 2 to 3 MB picture ;) A sure way to stuff up their email "in box" too! Now a day you can easily re-size your photos by compressing them on line, the last time I Google "resize photos"; I got SIX MILLION hits! There are literally hundreds of FREE sites that you can upload your pictures and get back a resized copy within seconds! But wait! I discover a lot of these so called FREE services either have hidden agendas or they are so long winded that after a while, I went back to my trusty Photoshop! 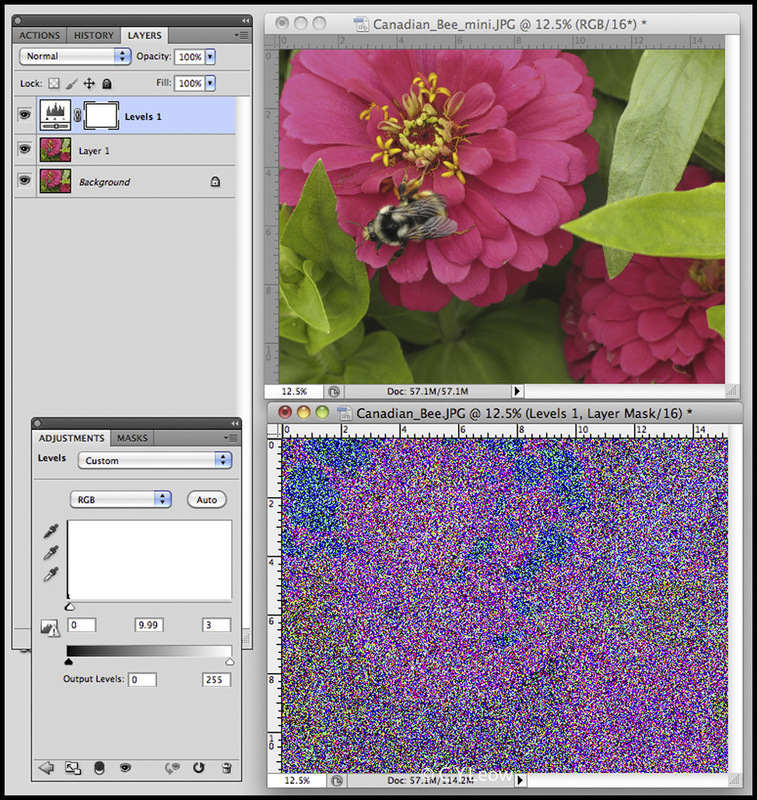 The technology works in the domain of baseline JPEG, resulting in files that are fully compatible with any browser, photo software or device that support the standard JPEG format. 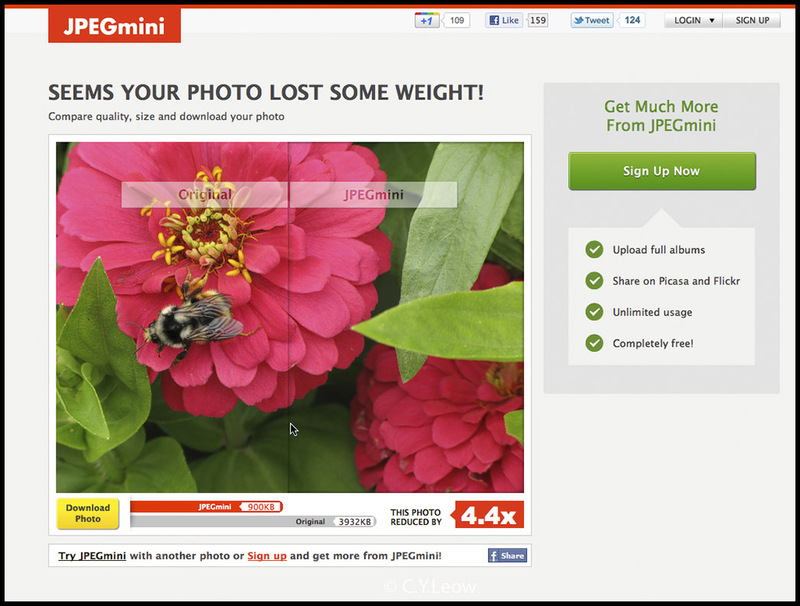 JPEGmini was developed by ICVT, an Israeli startup company based in Tel-Aviv. which is dedicated to optimizing media compression technologies. ICVT is lead by serial entrepreneurs and veterans of the Israeli technology industry, possessing an extensive experience in media compression and delivery technologies. I decided to upload my "Canadian Bee" photo that I took with a Canon G9 as the test. 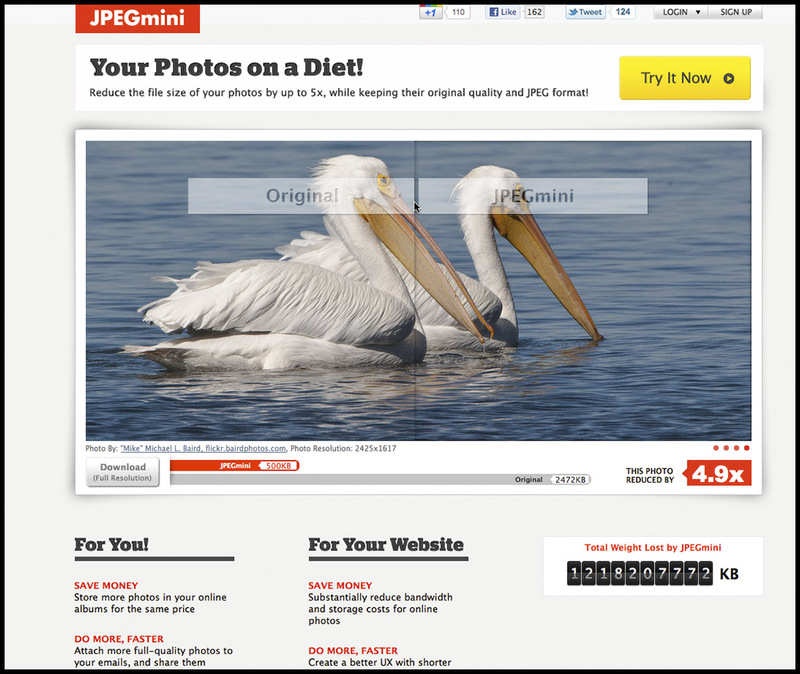 In less than 15 seconds, the 4 MB JPEG file was reduced 4.4 times by JPEGmini! The photo is now 930K! That was blazing FAST! I am sure my cable broadband help! I downloaded my resized photo by clicking the bright yellow button. Side by side, the 930K JPEGmini photo (bottom) look the same as the 4 MB original. What if we blow it to 200%? Will JPEGmini substantiate their claim of "keeping their original quality"? Can you see any difference between the two crops? I cannot! I am again impressed! 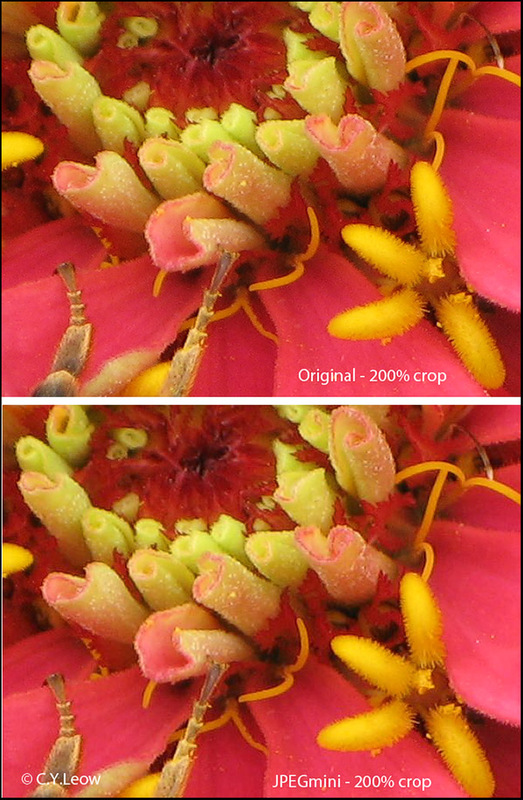 In my article on JPEG Noise and Artifact I showed you how you can visually see how much noise your JPEG compression add to your picture. I used the same method on these two pictures to find out. See my screen grab below. Looking at the "noisegram", I dare say JPEGmini executed a really smooth overall compression. May be that is why I do not notice any tell tale JPEG "blocks" in the blow up? But is that real cutting edge in compression technology? 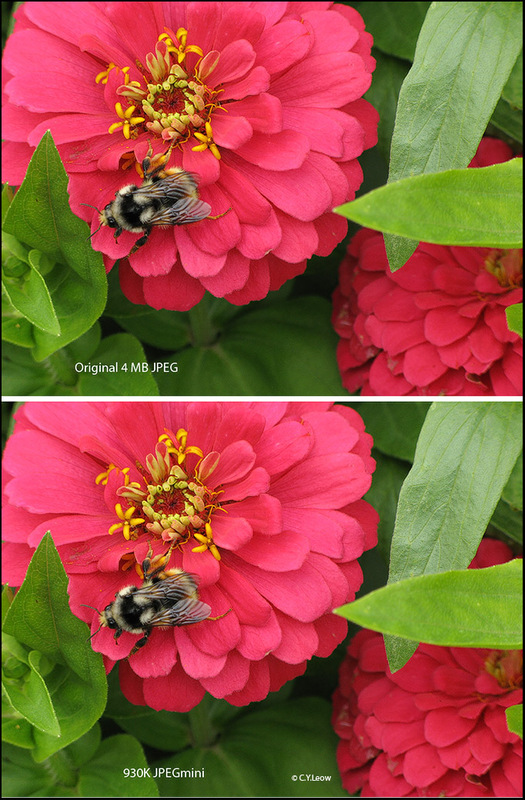 To find out, I re-saved my original bee photo with Photoshop as a Q7 (quality 7) file. Photoshop squeezed the picture into a 721 KB file, even smaller than JPEGmini. Can you see the difference? None of the people I asked notice any difference. I applaud JPEGmini for it's simple yet elegant lay-out, it is easy to use and not forgetting it is very fast too! My six million dollars question to ICVT is, if software like Photoshop can do the same job better; how are you going to sell your service to business? Oh... did I mention I do not like these sentences in your Term of Use? JPEGmini is fully automatic, will you fine-tune compression for hundreds of photos? probably not.